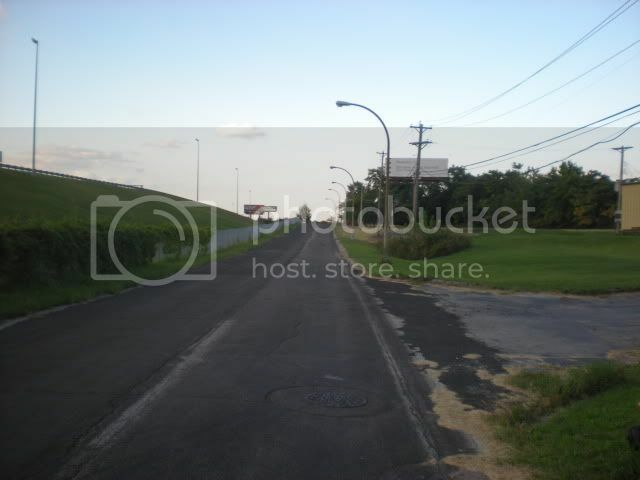 I saw in the paper a couple weeks ago that the Osage Nation purchased the Sugarloaf Mound. I've heard about it for years but had no idea where it was, other than that it's within reasonable walking distance of my house. Let me tell you, it is not easy to find. It's highly visible from I-55 right around the South Broadway exit (on the right if you are driving east,) but when you are walking down South Broadway it is hard to find. Even when you are on the right street, it's still hard to be sure. Then all the sudden, there you are in front of what is unmistakably a Native American mound. I wish I had thought to find it BEFORE it sold, because according to the listing agent's blog, I missed a bunch of open houses. The house is probably not long for this world. Sugarloaf Mound is the last Native American mound on the St Louis side of the river, and the Osage purchased it in the interests of historic preservation. 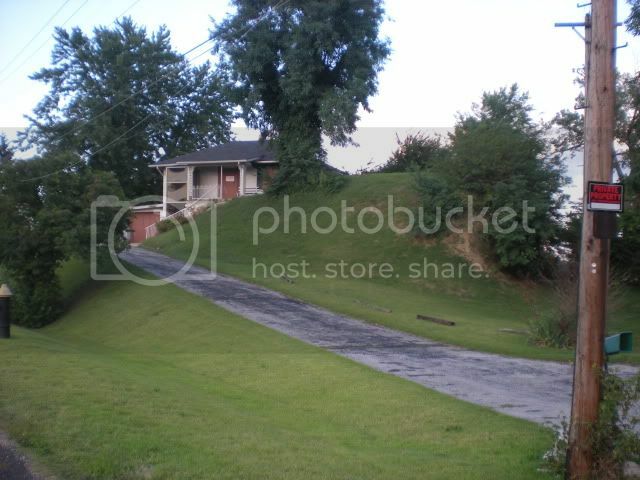 The house was sold "as-is" and is apparently in need of major repair/updating, so it's likely it will be torn down. I've heard that the Osage may build an interpretive center, so I will be following this story and updating if things progress. 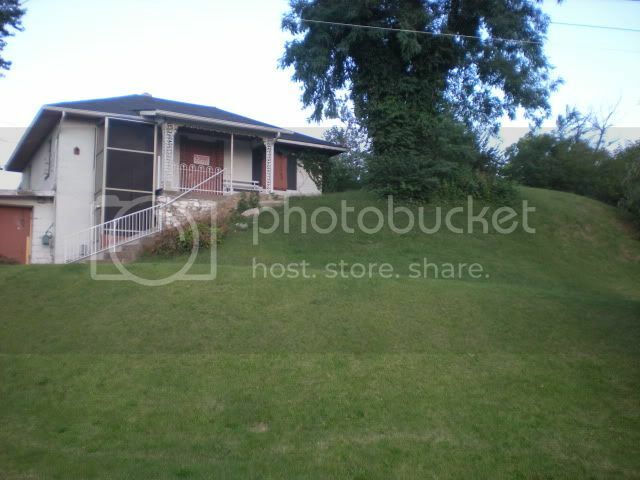 You can see more pictures of the property and the house on the Circa Properties website. Hopefully they will keep the listing up for a little bit. Update December 2013: Sugarloaf Mound has been in the news again recently. The interpretive center is still in the works. Here's one you've probably seen driving north on the Great River Road, and I bet most of you have said, "What the heck is with that ugly bird thing?" Many thousand moons before the arrival of the palefaces, when the great magolonyx and mastodon, whose bones are now dug up, were still living in this land of green prairies, there existed a bird of such dimensions that he could easily carry off in his talons a full grown deer. Having obtained a taste of human flesh, from that time he would prey upon nothing else. He was as artful and he was powerful, would dark suddenly and unexpectedly upon an Indian, bear him off into one of the caves of the bluff, and devour him. Hundreds of warriors attempted for years to destroy him, but without success. Whole villages were nearly depopulated, and consternation spread throughout all the tribes of the Illini. At length, Ouatoga, a chief, whose fame as a warrior extended even beyond the great lakes, separated himself from the rest of his tribe, fasted in solitude for the space of a whole moon, and prayed to the great spirit, the master of life, that he would protect his children from the Piasa. On the last night of the fast, the great spirit appeared to Ouatoga in a dream, and directed him to select twenty of his warriors, each armed with a bow and poisoned arrow, and conceal themselves in a designated spot. Near the place of their concealment, another warrior was to stand in open view, as a victim for the Piasa, which they must shoot the instant that it pounced upon his prey. When the chief awoke in the morning, he thanked the great spirit, and returning to his tribe, told them of his dream. The warriors were quickly selected and placed in ambush, as directed, Ouatoga offered himself as the victim. He was willing to die for his tribe. Placing himself in open view of the bluff, he soon saw the Piasa perched on the bluff, eyeing his prey. Ouatoga drew up his manly form to its utmost height, and planting his feet firmly upon the earth, began to chant the death song of a warrior. A moment after, the Piasa rose into the air, and swift as a thunderbolt, darted down upon the chief. Scarcely had he reached his victim, when every bow was sprung and every arrow sent, to the feather, into his body. The Piasa uttered a wild, fearful scream, that resounded far over the opposite side of the river, and expired. Ouatoga had held an invisible shield over him. 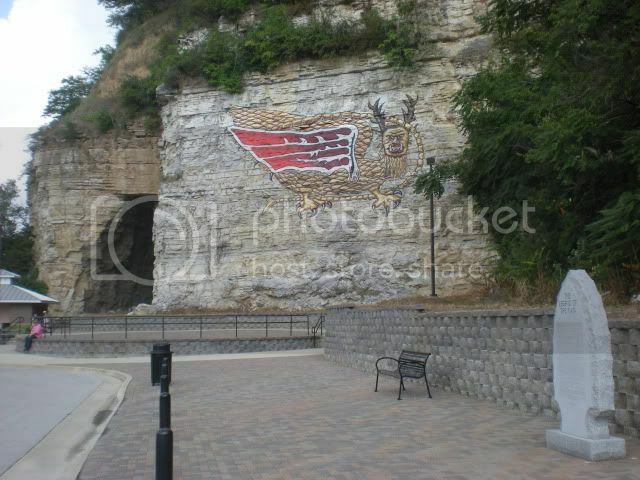 In memory of this event, the image of the Piasa was engraved on the bluff. Such is the Indian tradition. The original Piasa was a petroglyph on a nearby cliff, which has since been destroyed. 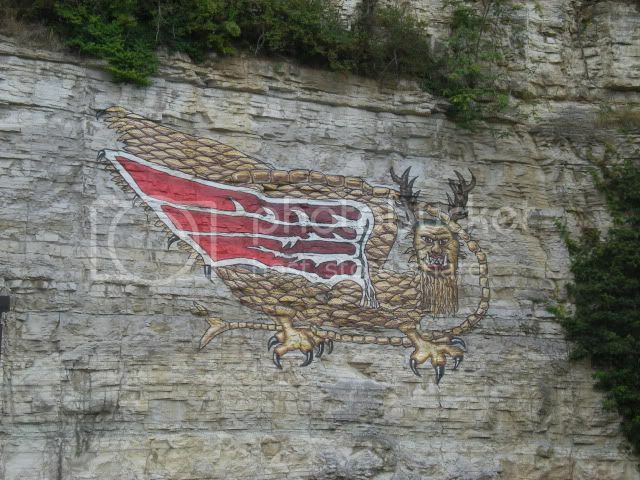 The current Piasa is a painting done by the American Legends Society and volunteers in 1998. This park is located is about a mile outside Alton and has a big parking lot for cyclists who are biking the Great River Road. 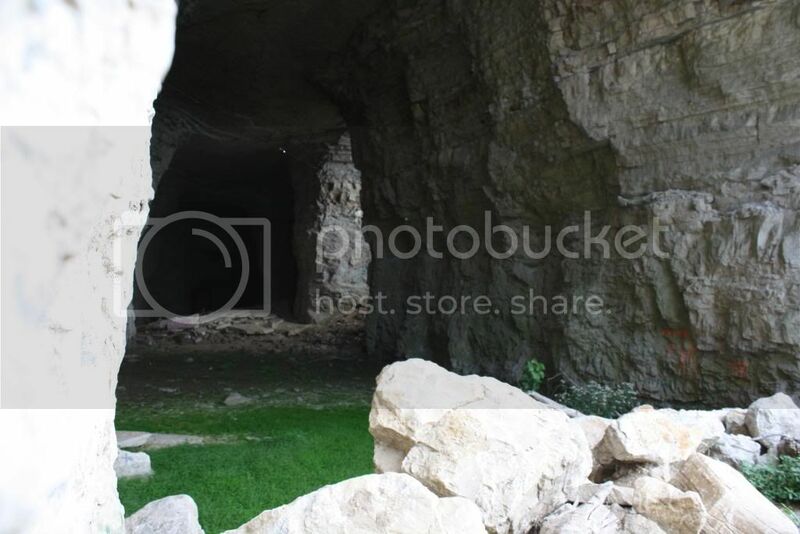 I was already familiar with the legend when we stopped here, so I was more interested in these caves. They are surrounded by chain link, and well, there were witnesses. 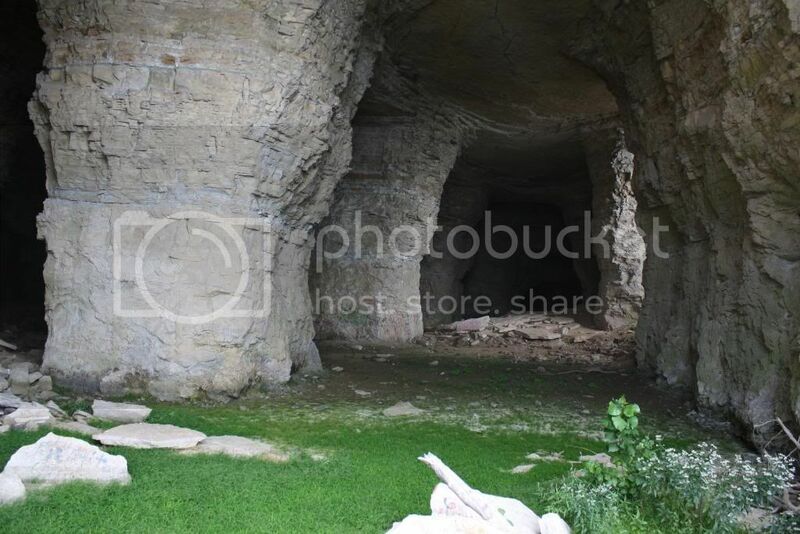 No exploring was done this day, but if you want to get an inside look, you can find an account on Underground Ozarks. 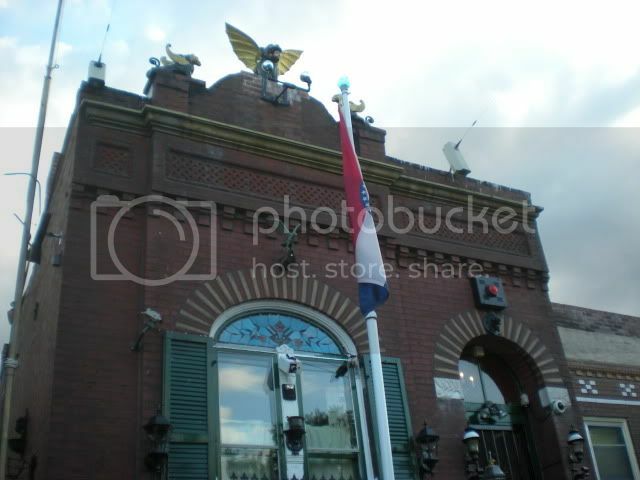 If you are familiar with Alton, the original location was below the first state penitentiary, which was later the Confederate prison. 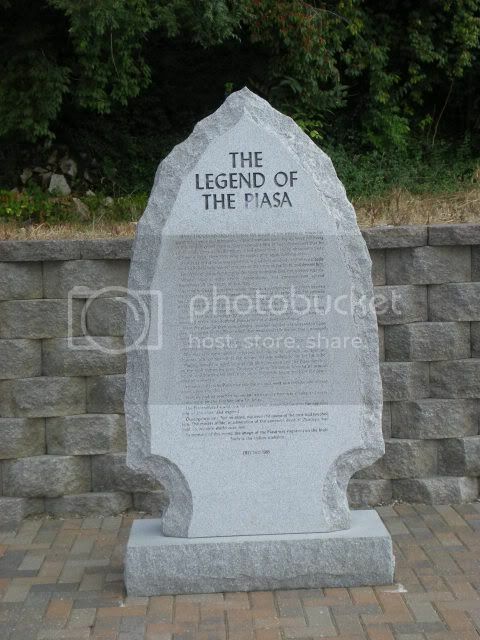 The site of the former prison is one of the stops on the Alton Hauntings Ghost Tours, and you can read more about the controversy surrounding the Piasa Legend on their website. I will have an account of the ghost hunting itself next month! This is one of my favorite houses from my old neighborhood. Admittedly, I forgot about it until Carrie asked me about it recently, even though my new house is barely a mile away. I got out of the habit of walking the dog on that side of Grand after I moved. This is Kabel House. 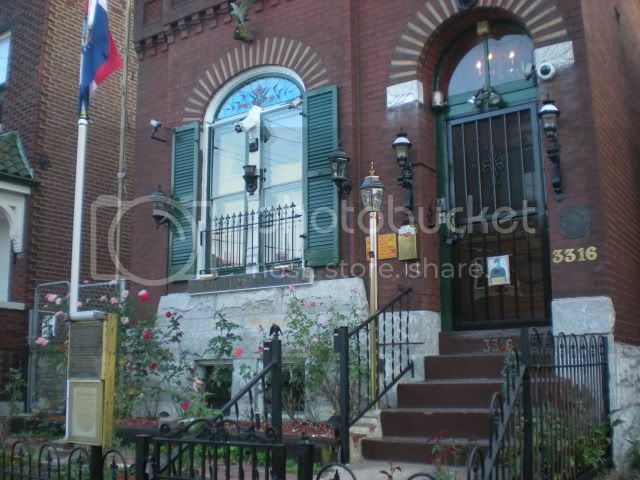 It's not open for tours, and the number of cameras on the outside of the house leads one to believe that the owner barely tolerates you stopping on the sidewalk to read his plaques. I did talk to him a few years ago when he was working in his yard and he's a no-BS kind of guy but not entirely unfriendly. I still remember that I was wearing a red Homestar Runner tshirt that day because when he explained the security system to me, he described it in his example of the conversation he would have with the office. I'm sure he has to deal with a lot of irritation, trying to maintain a historic property in that neighborhood. Whereas, on October 27, 1886 the United States Secretary of Indian Affairs met with the Tribal Leaders of the Cherokee Nation at this site to sign the final treaty of Civil Liberties, this historic meeting places the property under the protection of the Dept of the Interior. Any person who vandalizes, defaces, or damages any part of this property will be prosecuted by Federal Officers of the Dept of the Interior. 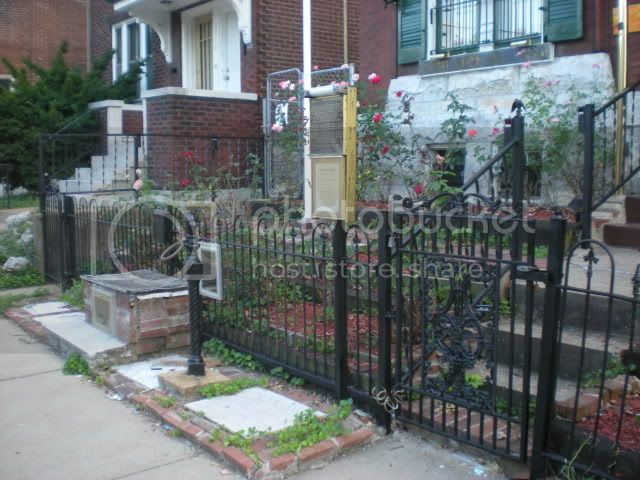 Some of the homes in this section of South St Louis are built upon the graves of men, women, and children of the Cherokee Nation, the true owners of this land. Come forth, O Great Spirit of the Cherokee People and return the clean sky, the clean air, pure water, and wild creatures, so your tribes can once again roam this area, their God given habitat, free from Anglo/Caucasoid invaders. PROPERTY MONITORED BY EXTERIOR CAMERAS THAT SEND VIDEO DATA TO SECURITY OFFICE WHO WATCH THE PROPERTY 24 HOURS. 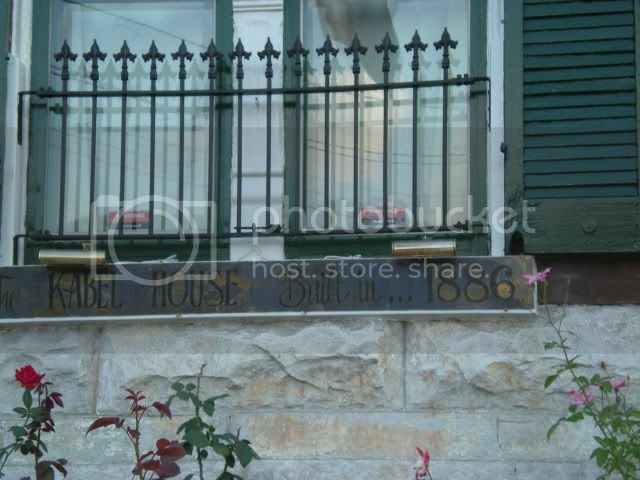 The sign under that says that the Kabel House was built in 1886 for Mr & Mrs Ferdinand Kabel and did not have electricity or indoor plumbing. It was restored in 1996 by Col Mohrman and is still heated by two wood stoves and a fireplace. At the sidewalk there is a carriage step and hitching post, along with plaques describing their use (and more warnings against defacing the property.) 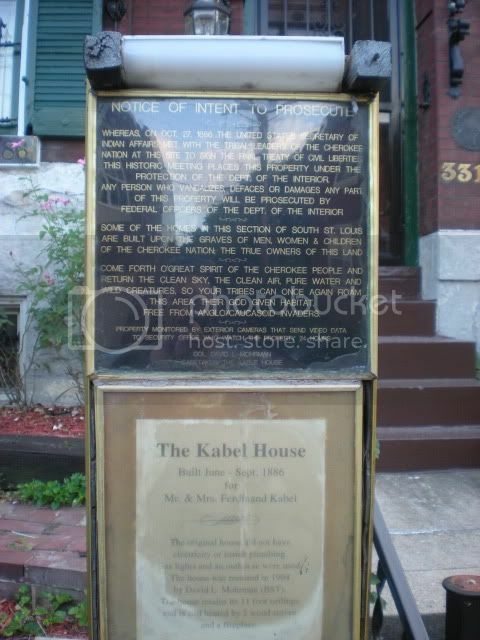 Kabel House is located at 3316 Itaska in South St Louis, MO. I'm sure I don't need to tell you that you should be respectful of the property should you choose to visit.